Pretentious – Grown Up, Now What? 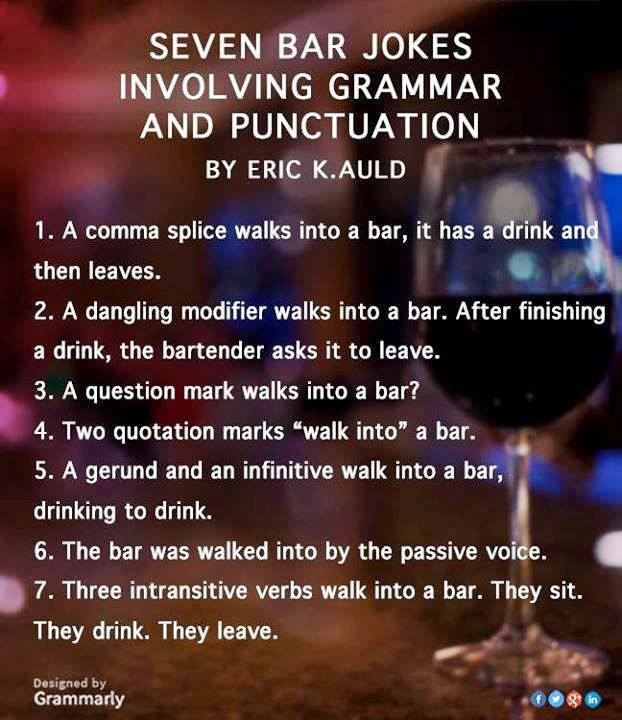 Recently I saw this bar joke plus grammar joke meme going around. The best part of this for me is the fact that I understood all of them! In the past, whenever I didn’t know something, I felt intimidated by those who did; My NPR experience is a perfect example. One thing I’ve learned over the years is that intimidation is not the universal response to that situation. Ultimately the semicolon was replaced with a period, because semicolons seemed too intellectual. Yup, proper punctuation is pretentious. Okay, here is where it gets funny: Much like with my “It was a dark and stormy night” post, reality is forcing me to change the direction of this post. The main lesson that stuck with me from my grammar and punctuation training is to look up all words to make sure there isn’t a situation of “I don’t think that word means what you think it means.” I had always thought of “pretentious” as “the flaunting of knowledge.” Um, not so much. Am I the only one who uses semicolons in casual writing? Or What word have you recently discovered that you’ve been using wrong?